← Forget Batfleck, How About Batwin? After a long, Probst-free summer, Survivor is finally back, and the man in denim is ready to preside over the case of Blood v. Water. With only a few hours until court is back in session, let’s get right to it. Well, from the looks of his very tentative entry into the water, it seems unlikely. But it was more of an encouraging start than that of Tyson’s girlfriend Rachel, who apparently agreed to sleep in the jungle for 39 days on the one condition that she can never get wet. When the Survivors and their loved ones arrive on dry land (including Kat and her boyfriend/big brother Hayden), they learn that they’ll be spending their first night alone, and while the game is afoot, the formation of the tribes will wait. Colton, of course, is back, because no ruptured appendix can deter a monster that terrible. He’s returned with his boyfriend Caleb, which serves to make him more sympathetic terrible. And even though he has his southern boytoy to take care of him, he’s still livid about having to spend a night in the elements. After the tribes are divided, one of returning players and the other made up of other rookies, Jeff throws another curveball, each tribe will immediately vote out one player. The newbies, wanting to waste no time in angering Randy Macho Man Savage Rupert, vote for his wife Laura, who seemed a bit perplexed about why there was a target on her back, even though she is wearing a tie-dye shirt that literally forms a target on her back. On the veterans side, Candace takes a real shot to the woodcock, getting the boot because, like us, no one on her tribe seemed to have ever heard of her. But wait, Doritos Locos Cool Ranch Tacos Redemption Island Arena is back! Which we’re not entirely excited about, but the new wrinkle – that players still in the game can swap places with their loved ones on Redemption Island – might make the change in format worthwhile this time. At the very minimum, it will result in at least one divorce. As soon as the Loves Ones get to camp, former NFL QB and budding meathead Brad Culpepper, of the Monica Culpeppers, gathers everyone on the newly formed TedDanson Tribe to remind them of when he fucked up in the beginning and basically said his wife was more important than his tribe. He assured them that was not true, which proved beyond a doubt that was true. Soon though, still feeling vulnerable even after his mea Culpepper, he shifts into strategy mode, realizing that the guys have the numbers, and even if they can’t use their advantage to vote out the girls, they can still get together and do a Magic Mike thing. Despite Brad’s talent for snapping wood in half, the TedDanson Tribe struggles in their first time out, unable to build fire, and they’re already starting to feel the toll of the game. Vytas, former drug addict and current yoga-head, relates that he’s so hungry and exhausted he can feel the liquid leaving his head. However, we think there might be another explanation for that. 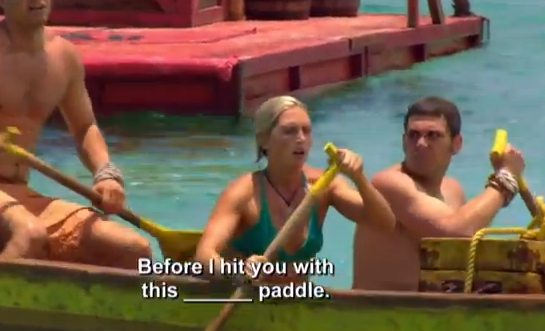 Over on the returning players Tribe, Colton, knowing how he was perceived last time around (as the absolute worst), decides to offer his own mea Colton for his previous wretched behavior. Or just offers a bizarre non-apology (#RACIST). But Colton soldiers on, knowing that his guy is somewhere, out there. When the Survivors receive Tree Mail teasing the next challenge, they immediately start to decide who will do what. Ciera and Katie, on the rookie side, claim the puzzle portion of the challenge, and also speculate that their mothers, Laura and Tina, will do the same. And also they seem to harbor a really dark, disturbing impulse to crush the women who gave them life. However, the moms are not so innocent themselves, basically boasting “I brought you into this world, I can slit your throat while you sleep.” So the stage is set for tense, and potentially bloody, challenge. But before we can get to the Take Your Daughter to School Day part of the challenge, we receive a definitive, indisputable answer to the season’s most pressing question. No, Gervase cannot swim. In fact, he might just be allergic to water, for his performance in the swimming part of the challenge made was impossibly, unbelievably awful. But while Gervase swims like he’s the Wicked Witch of the West, it’s Colton who proves once again that he’s the real monster, lasting about eighteen hours before he threatens someone with a blunt object. Racist, misogynist, misanthropic, belligerent, the guy has it all. But that was just the undercard, as the moms make like hamsters and eat their young, making up a huge deficit and taking the victory for the veterans. Like a good Sweet 16, the daughters are embarrassed by their mothers. But the real embarrassment still belonged to Gervase, who rebounded from needing to be Hasslehoff’d and carried ashore by Aras to then celebrating the victory as if he hadn’t almost drowned and cost his own tribe the win. The behavior, as one might imagine, did not go unnoticed by the TedDanson Tribe. ALWAYS REMEMBER, MARISSA, LOOSE UNCLES WHO CAN’T SWIM SINK SHIPS.